Winter has been pretty tough on us this year. It just never seems to stop snowing. We usually travel to Las Vegas in the fall for our anniversary, so I was surprised and delighted when Matt suggested another trip over Valentines Day to get away from the snow. We fly out of Detroit and cross the border at Port Huron, so on our way to the airport we decided to stop for some BBQ at Fuel Woodfire Grill in Port Huron. To celebrate our little holiday, I had a Haymaker bourbon cocktail and Matt had a Hopslam from Bell's Brewery in Kalamazoo. 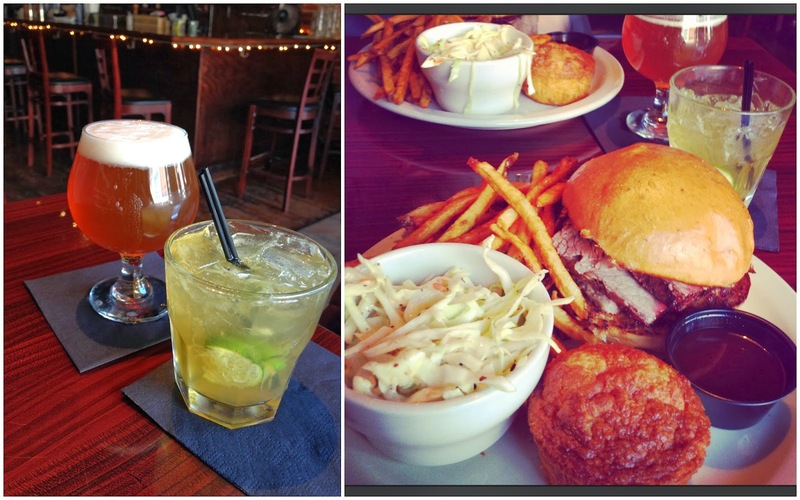 We both ordered the brisket sandwich which was smoky and delicious. The fries were really excellent as well. On to the airport. I had enough points to upgrade us to First Class on our flight. It was our first time flying first class and I'm afraid we're spoiled for life. We loved the legroom and spacious seats and the food was way better than expected. This is dinner: Cheese ravioli with roasted vegetables, a crisp salad and a roll, and vanilla bean gelato for dessert. Once we arrived in Vegas we picked up our rental car. We rented from Sixt this time. We rented from them when we visited Germany in 2009, but they recently expanded to the US. We were thrilled to be upgraded to a BMW 3-Series. We use the car to do a little shopping and sightseeing during the day and keep it parked at night so we can have cocktails aplenty. On this trip we got a great rate at Aria so that's where we stayed. 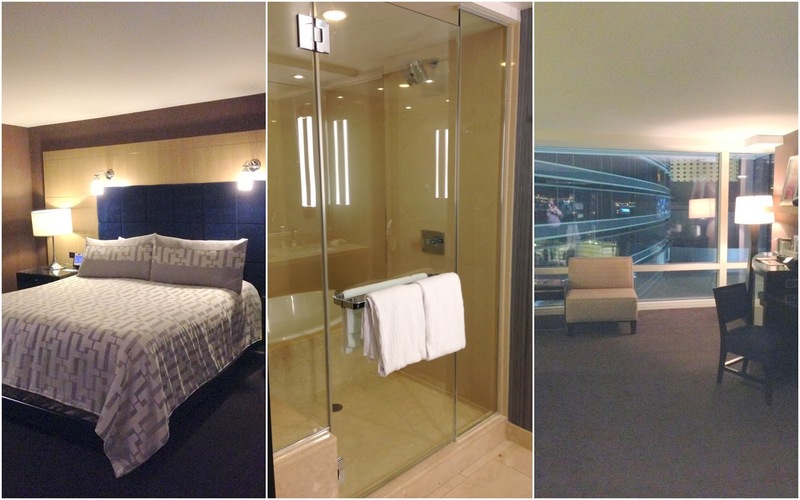 We'd stayed there once before and it is, hands-down, our favourite hotel/casino in Vegas. It is newer and the rooms are huge and modern. We love the location too, right between the Bellagio and Monte Carlo. Aria has a fantastic pizza place called Five50. They have a slice take-out counter where you can grab a slice and beer and that's what we did. The crust is so tangy, thin and tasty. The next morning we were up early due to the time change and we went somewhere I've wanted to go for a long, long time. Bouchon is Thomas Keller's famous Napa bistro and there's a location in Las Vegas as well. Their breakfast is incredible. We ordered the full Breakfast Américaine which includes two eggs, bacon, sausage, brioche toast & jam, coffee, fresh-squeezed juice and a choice of breakfast pastry. 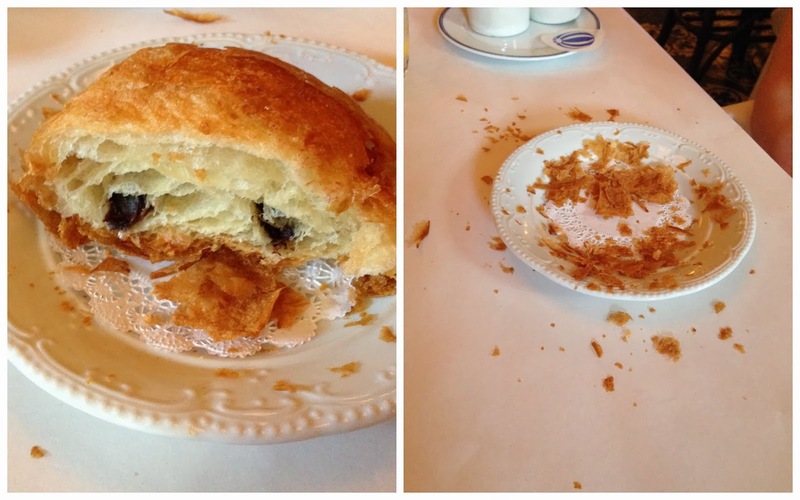 My absolute favourite part was the pain au chocolat. Outstanding. Matt loved their coffee and was delighted when they gave him several refills and a cup to go when we left. The restaurant itself was beautiful and we'd love to return for breakfast or dinner. 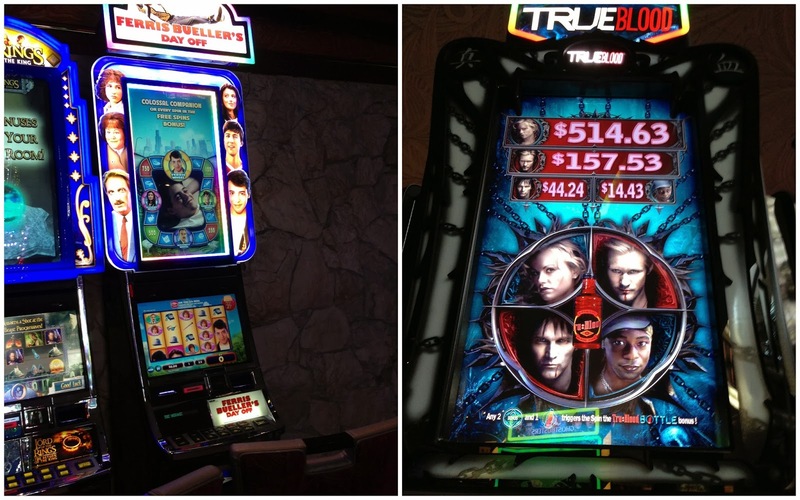 We played a few new slot machines while we were there. They're starting to target these things to my age group and I LOVE it. Last time I fell in love with Footloose, but this time Ferris Bueller was my favourite. I even got to play almost all the bonus rounds and won! We went back to our favourite happy hour at Sushi Roku. The popcorn shrimp tempura was amazing. We ate a lot of sushi and shrimp and had lots of wine. Next we decided to try something new. We went to a midnight show at the Cosmopolitan called Rose.Rabbit.Lie. It is a very new show that is a little mysterious. It's not a typical show - it's a venue with different rooms. It's a restaurant, bar, and show combined. We didn't have dinner there, but just went to the bar and the short midnight show. We were escorted into a busy bar. Since I knew there were other bars, I asked if we could go somewhere quieter and we were led to the Study, a smaller, quiet bar. The cocktail program here is amazing. I had a delicious tequila drink and Matt had a Monkey Gland which was gin, absinthe and an orange cream on top. Afterwards we went to the show. A female DJ played while two amazing tap dancers performed. There was a fire eater, some acrobatic performers and dancers and at the end, the stage descended into the floor and the space became a club where the audience got up to dance! The midnight show is only about 30 minutes long but there are longer shows early in the evening. It was fascinating and I'd highly recommend it. Afterwards we found the "Secret" pizza place on the 3rd floor of Cosmopolitan and had a great slice. The next morning we were pretty tired. We went for a swim and then headed to Holsteins at the Cosmopolitan for burgers. They were huge but we did our best and felt much better afterwards. We had a voucher from the MyVegas Rewards Facebook game for a champagne tasting at Monte Carlo. We each had a glass of champagne, cheese, fruit, chocolate strawberries and a heart-shaped cookie. All for free! It was great. For our Valentines dinner we decided to go to Public House at the Venetian. I had a pear ginger cocktail and Matt had a Squatters Outer Darkness Stout. I'd read the poutine here was fantastic and it was true! It's made with real curds and duck confit! They poured the gravy over it at the table. After this we really didn't need much more. But we didn't let that stop us! We also ordered braised short ribs with carrots and onion rings which were fantastic. And Pork Belly & Clams with sausage and chickpeas. It was all too much! We had tickets to see The Beatles LOVE Cirque du Soliel show. We had free tickets to this show through MyVegas as well. The show was amazing. The music is so well done and the performances are beautiful. It was a wonderful way to wrap up our last night in Las Vegas and Valentines day.